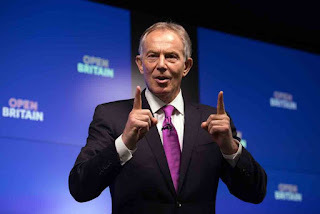 HPANWO TV: Go to Hell, Tony Blair! Go to Hell, Tony Blair! See here for the film: https://www.youtube.com/watch?v=PW8gbyaGgQo. Tony Blair, the former Prime Minister, has delivered a speech to the "Open Britain" group calling for the rolling back of Brexit. Source: http://www.bbc.co.uk/news/uk-politics-38996179. This film was originally only available on my Vidme channel, not YouTubel but with the closure of Vidme, see: http://hpanwo-tv.blogspot.co.uk/2017/12/goodbye-vidme.html, I have decided to put it on YouTube. See here for the accompanying HPANWO Voice article: http://hpanwo-voice.blogspot.co.uk/2017/02/up-yours-blair.html. See here for additional background: http://hpanwo-voice.blogspot.co.uk/2017/01/brexit-will-be-rock-ard.html. Did Britain start the World Wars?